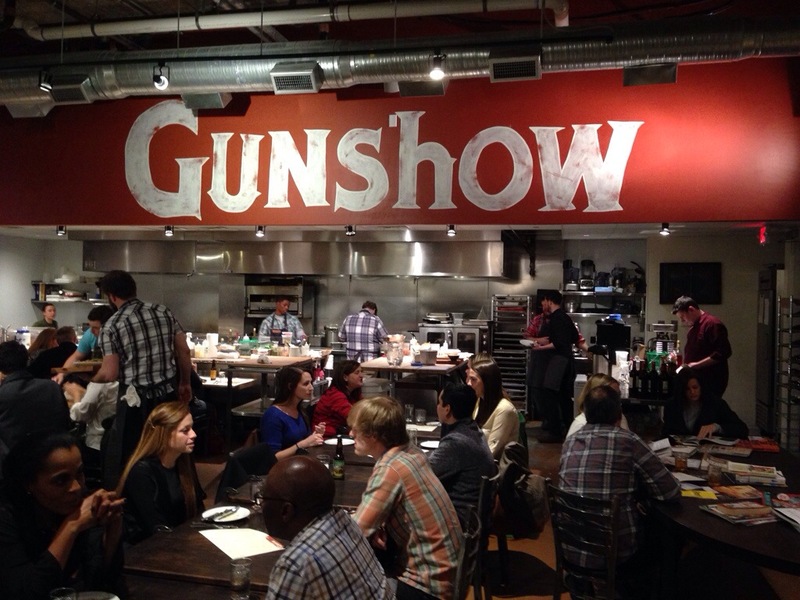 Since I first heard about Gunshow, I was intrigued. A dinner at Woodfire Grill in 2007 or 2008 really kick-started this fine dining obsession – and Kevin Gillespie was the kicker. When I watched an interview about what he was planning to do at Gunshow (in east Atlanta’s Glen Park neighborhood), I knew that we needed to go. And tonight, to celebrate twenty-six years of marriage to the most wonderful woman on the planet (whom I’ve yet to food poison from one of my eating adventures), we had a 7:00 reservation. We arrived, just as seven rolled around, after figuring out that there was additional parking behind the restaurant (as the street was full). 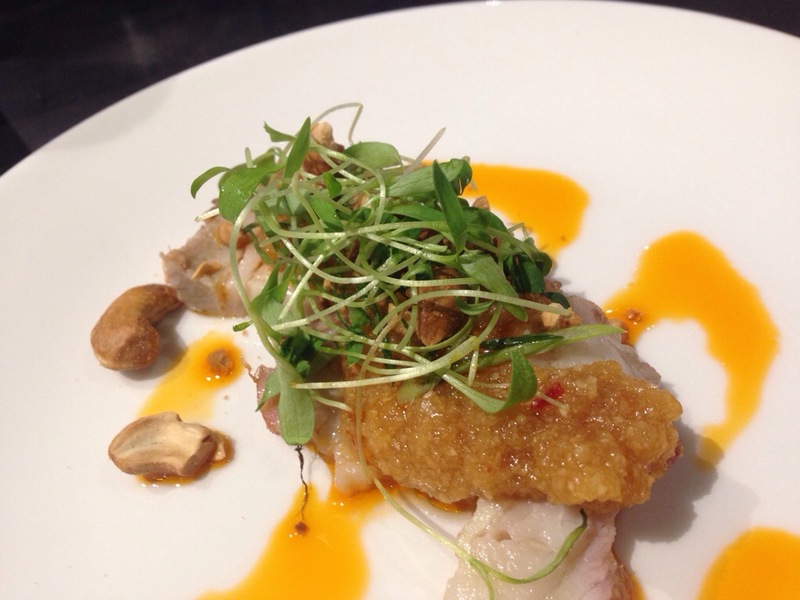 This is a slow, Southern, intimate version of dim sum. She then explained that there were four chefs in the kitchen who would walk around as they finished dishes with several servings on a cutting board, stop at your table, tell you what they had and ask if you wanted one. Sounded simple enough. (This was one of those “big nights out” and I had already decided that we were ignoring the right side of the menu, where the prices resided.) Within five minutes of sitting down, a chef walked up with a cheeseburger in wax paper, explaining that this was his version of his favorite burger on the planet: an In-N-Out Double Double, “animal style”. We’re huge fans of In-N-Out, and I had read about his version of that burger. But it wasn’t on the “scorecard” when we looked at it upon being seated. There was, however, this formerly blank line, which now read cheeseburger. When we were looking at the menu and reviews on-line, Jo had mentioned that this was one of the the dishes that she hoped to try. 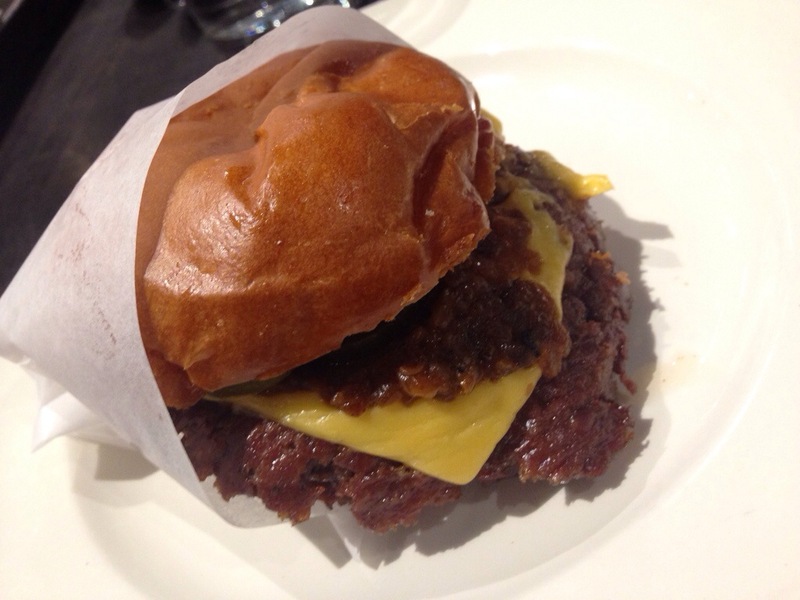 Here’s the thing – when you walk into a restaurant and someone shows up in the first few minutes with a killer cheeseburger (that you didn’t even have to order), you’ve hit the jackpot. The burger delivered as promised and we left the wrapper empty on the serving plate. A few minutes passed, and another chef showed up with the first rounds of snacks, a soup that we didn’t take and a pork belly with chile mud and cashews, that we both knew that I was ordering as soon as we heard the words “pork belly”. I took a bite and realized that I had apparently stopped listening at “pork belly” – there were Thai chiles involved, and that big bite LIT ME UP. I was stunned – it actually reminded me of the numbing beef dishes in a good Szechuan restaurant, but it was great. I did, however, temper my bites of the sauce with the rest of the dish. One of the highlights of the rest of the night was watching other diners’ faces when they took a bite of the same thing. The seating was perfect – not crowded in the least (one of my pet peeves is trying to fit too many people in a restaurant). I rough-counted the seating and would estimate around 75. We sat at the 3rd and 4th seats of what would have been a table for sixteen at most places, but, instead, there was a two-top c-clamped to our two top (kind of like this _-_ ), situated between us and the table next to us. And the server’s use of the word “intimate”, which seemed odd when spoken, was apt. The meal felt almost cozy – like you were dining at a friend’s restaurant where they were cooking just for you. 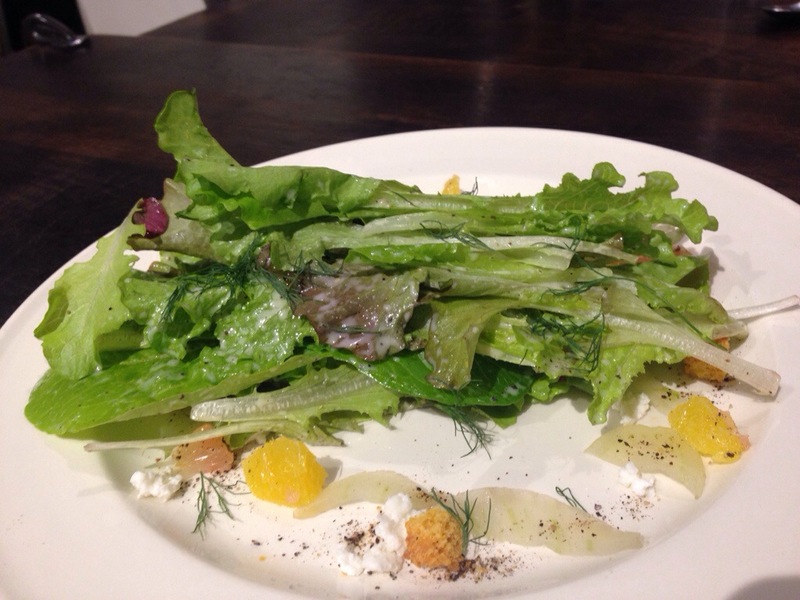 The next dish, a salad of local lettuces, with winter citrus, goat cheese feta and a buttermilk vinaigrette dressing, ended up being Jo’s favorite dish of the night. I can’t comment, as it didn’t appeal to me in the least, but she cleaned that plate while I was finishing the pork belly. This was shortly followed by one of three entrees that we saw and passed on, the flounder with tatsoy and parsnips (the others were a pork skin risotto and a seared scallop togarashi). 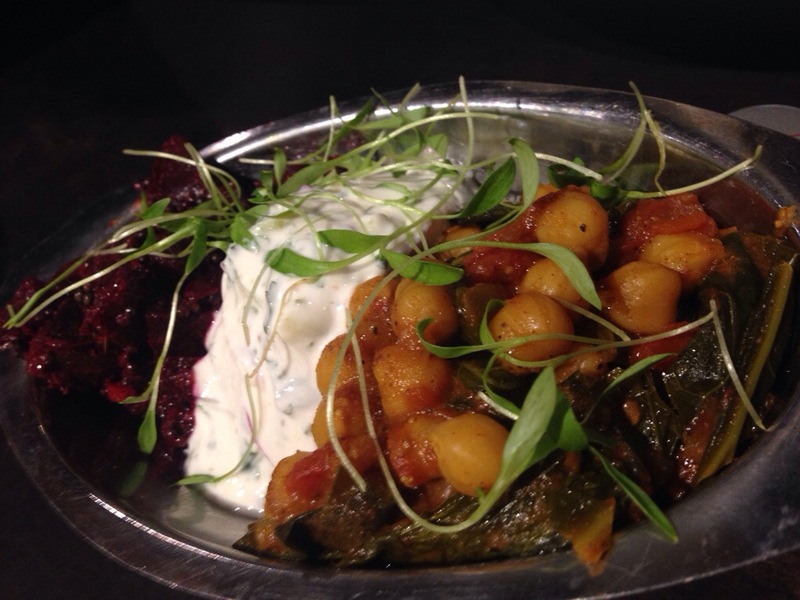 We did take the next dish, which was the only one that we didn’t really love of the evening, an Indian spiced beets with riata (the dill yogurt sauce from Indian cuisine) and stewed chick peas. The riata was very well prepared and the chick peas, which were cooked in a masala tiki sauce, were good, as well. The beets, which were curried? Not so much. 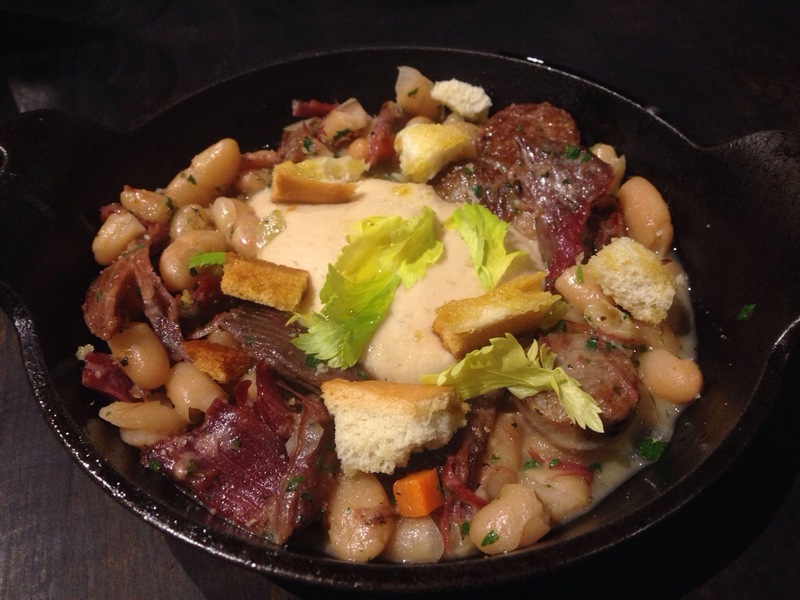 Next up was a dish that they labeled “Something similar to a cassoulet” (I had googled cassoulet), which had pork sausage, duck confit, fava beans, a white bean purée, a green of some type and croutons. I’m generally not a duck fan, but this was excellent, not greasy and full of flavor. The white beans had a huge amount of flavor and that skillet was returned empty. I was still on the lookout for the roll of beef I’d seen rolling by on a tray earlier, and when Chef Brian launched into the description, as soon as I heard “American Wagyu” I quit listening and started to salivate. The dish was called matambre – a traditional Argentinian Christmas dish – he explained. But his version was prepared with an American wagyu flank steak, rolled with Anaheim and another chile, carrots and parsnips, tied into a roll, baked whole and sliced table-side. 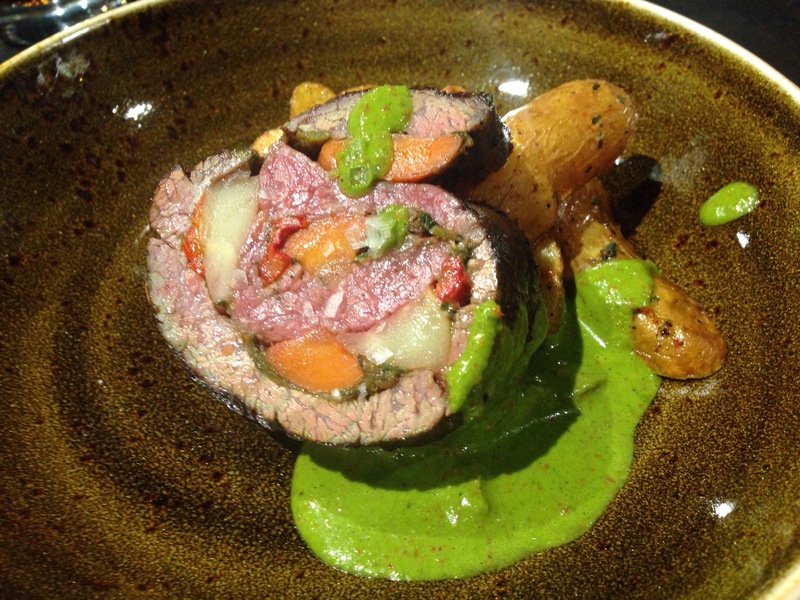 It was served with fingerling potatoes and a chimichurri sauce. At one point, I found myself chewing with my eyes closed, my head bobbing from side to side in celebration. Sad, huh? We shared this dish, with my beloved eating the outer, more well-done edges and me eating the pink center. How good was it? After we finished, I flagged the chef down as he walked behind us and ordered a second. Just as good as the first. We had seen everything (from the scorecard) except for the spare rib, the shrimp and the pasta dish and we were stuffed. But we had eyed the dessert options. The starter returned and asked if we were ready to look at desserts and we eagerly said “sure”. Within five minutes the dessert chef arrived with a sampling of desserts – a warm banana pudding, a deconstructed Dutch apple pie and a chocolate thin mint. We chose the banana pudding and he went back in the kitchen and, in a short time, a warm dish of banana pudding arrived. 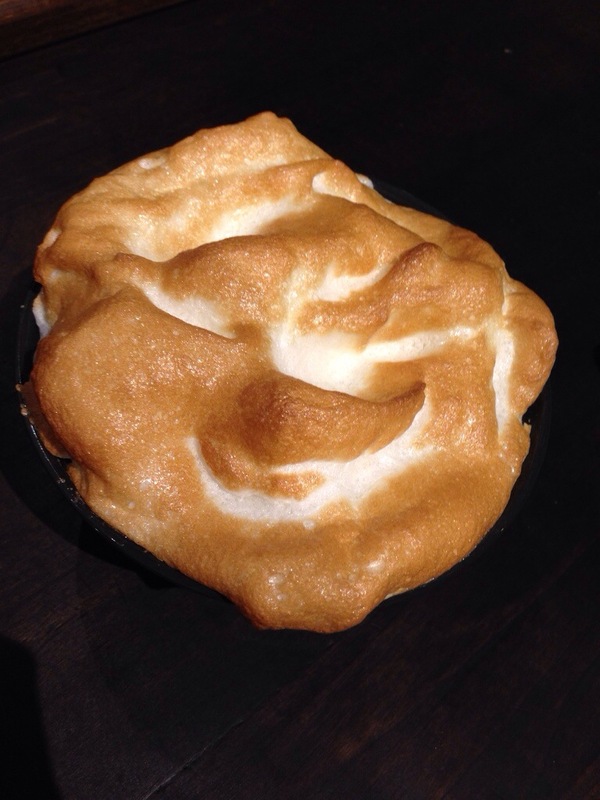 Look at that meringue! I generally prefer my banana pudding cold, but I may have been converted. This dish (in which we didn’t find any vanilla wafers) was amazing. At this point, we were really done and they took our “scorecard” somewhere and returned with a total. I was, honestly surprised that it was right at $100.00 – I had expected we had spent more. I’d heartily recommend the place for a couple looking for someplace new and exciting. Or for a party of four that shares well and enjoy a good time. If, on the other hand, you’re concerned about the amount you might spend, you might miss something wonderful, so keep that in mind. As to the atmosphere, it was slightly loud, but not to the point of being annoying – it was more of an energy. I told someone the next day that we really enjoyed the night – after 26 years the company was still great, the atmosphere was comfortable and the food was amazing.